One of the things I resolve to do in 2010 is to devote substantial amounts of intentional effort towards the development of my creativity. I view creativity as a personal strength, and I think it makes sense to spend considerable time enhancing this asset. Inspired by my friend Artie Isaac, I am going to engage in a rigorous program to supercharge my creativity. The list is designed to explore multiple dimensions of creativity. This includes topics such as design thinking, leadership, time management, business strategy, philosophy, psychology, sociology, and motivation – all of which are essential parts of living a creative life. 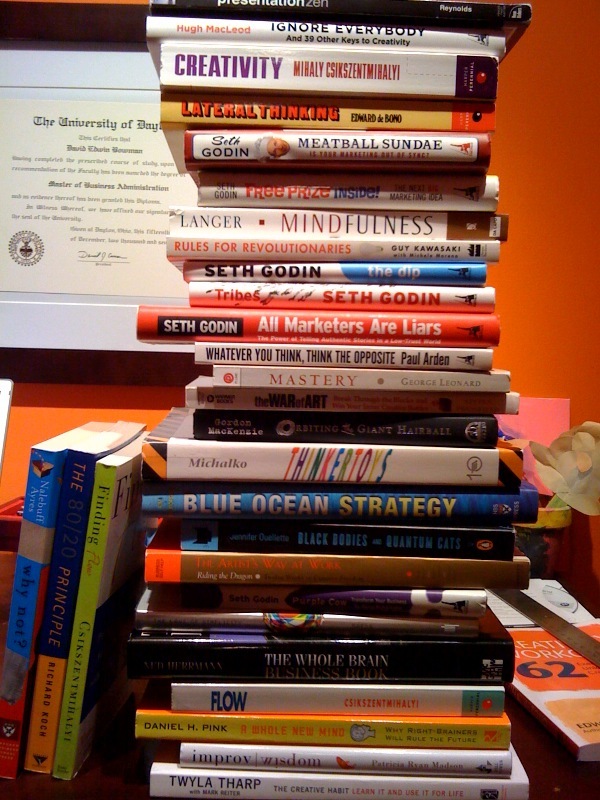 I am sure other titles will be added as the year rolls on (The new Seth Godin and Garr Reynolds books will definitely be on the list). I am open to your suggestions too. I am also going to continue to enhance my Creativity by writing about some of the things I learn from each of these books. This represents a way to improve my writing skills as well as to internalize the concepts conveyed in each book. Additionally, many of these books contain programs, exercises, and activities designed to enhance creativity, which means that I am going to be spending a considerable amount of time being creative too. Examples include performing an exercise from the book Creativity Workout by Edward De Bono every day, and writing 3 pages of text by hand each and every morning as prescribed in the book The Artist’s Way at Work. Ideally all of this results in new adventures, challenges, and accomplishments for me, as I not only develop my creativity, but use it to change my world.